subroutine The Runner cannot make another run this turn. Trap, because Excalibur notably has no ICE type. It cannot be broken except by AI breakers. Excalibur, instead, hangs out with the Upgrades. For a measly 2 credits, Ash 2X3ZB9CY, Red Herrings, and Caprice Nisei, along with other strong Upgrades that typically require a second clean run, become maximally efficient. Excalibur + Red Herrings in a server means that the Runner will pay those 5 credits. Ultimately, try to separate this card from the Grail subtype. 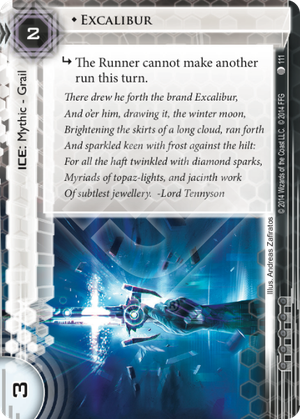 In fact, I would instantly cut it from decks running the actual Grail ICE. I firmly believe this card is strongest when slotted into Glacier-style decks that intend to score in a remote, who naturally run powerful Upgrades to protect them. I have found this ice to be particularly great in RP as the runner is forced to run a central server. Plop it down in front of HQ and/or R&D while having your score server ready with an agenda. Rez it when they run either central server and BAM, an open scoring window. Make sure that that you have Swordsman out in case they are running AI breakers, they only thing that can stop this ice in a hurry.